The trees lining the fairways are probably the most outstanding feature of the par 72 golf course with a course rating of 72. Bunkers are mostly found only around the greens and a few shallow water hazards make holes 5, 6, 8, 9 and 12 very interesting. The Golf Club was awarded the prestigious Golden Arrow Award for being the most outstanding sports club in the Free State and Northern Cape. 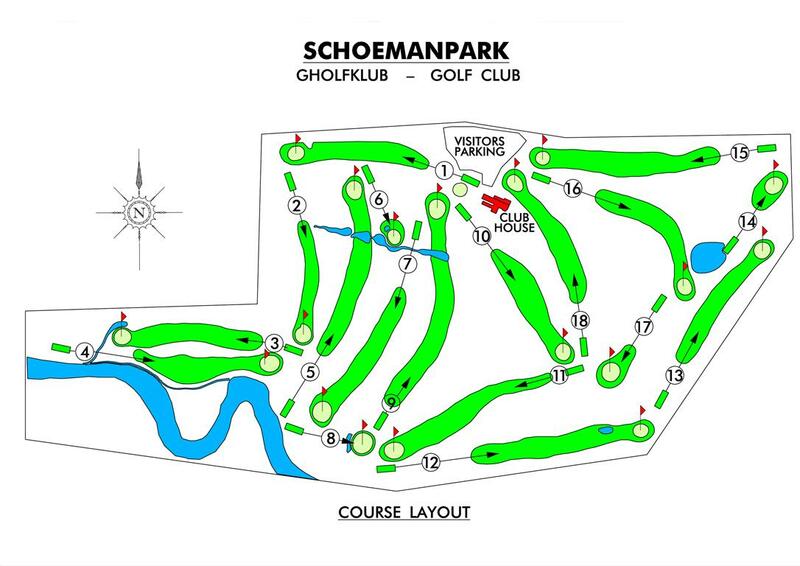 The Schoeman Park golf course is noted for its tall trees which come into play on many of the holes, including the 2nd which is a shortish par-four where the drive must be steered through a narrow avenue of foliage. The 4th hole, stroke two on the card, is a tough 415-metre par-four with out-of-bounds on the right and thick, wiry rough to contend with. The next hole is a splendid par-five of 501 metres with a strategically placed water hazard crossing the fairway about 120 metres from the green. On the inward loop, the 395-metre dogleg par-four 13th stands out, as out-of-bounds on the right and the tall trees which are on either side of the fairway mean that accuracy off the tee is vital. The drive must again be precise at the 417-metre par-four 16th which bends almost 90 degrees to the right. The 18th curves to the left and there is plenty of rough and trees both on the left and on the right of the fairway.